“This season started on Nov. 17th, and is tied with 2013 for the earliest southern hemisphere season in the CIPS data record,” says Cora Randall, a member of the AIM science team at the University of Colorado. NLCs are Earth’s highest clouds. They form more than 80 km above Earth’s surface. Indeed, they are a mixture of Earth and space: Wisps of summertime water vapor rising from the planet below wrap themselves around meteoroids, forming tiny crystals of ice. Emphasis on summertime; NLCs appear on the eve of summer in both hemispheres. There is growing evidence that noctilucent clouds are boosted by climate change. In recent years they have been sighted at lower latitudes than ever before, and they often get started in earlier months as well. Readers, you can monitor developments over Antarctica right here on Spaceweather.com. “Daily daisies” from NASA’s AIM spacecraft are automatically posted every 24 hours, showing the dance of electric-blue around the frozen continent. 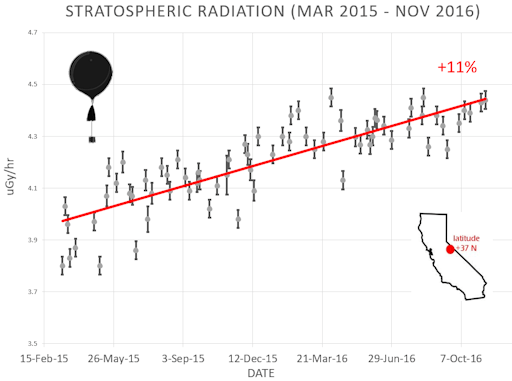 Data show that cosmic ray levels are intensifying with an 11% increase since March 2015. Cosmic rays are high-energy photons and subatomic particles accelerated in our direction by distant supernovas and other violent events in the Milky Way. Usually, cosmic rays are held at bay by the sun’s magnetic field, which envelops and protects all the planets in the Solar System. But the sun’s magnetic shield is weakening as the solar cycle shifts from Solar Max to Solar Minimum. 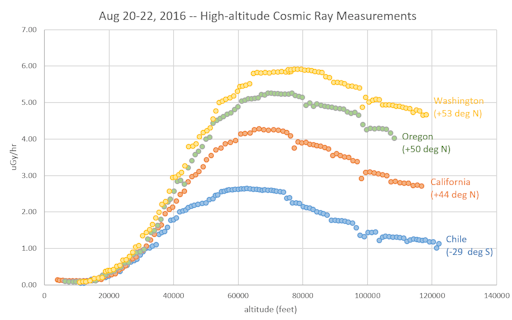 As the sunspot cycle goes down, cosmic rays go up. The sensors we send to the stratosphere measure X-rays and gamma-rays which are produced by the crash of primary cosmic rays into Earth’s atmosphere. In this way we are able to track increasing levels of radiation. The increase is expected to continue for years to come as solar activity plunges toward a deep Solar Minimum in 2019-2020. Solar Minimum is widely misunderstood. Many people think it brings a period of dull quiet. In fact, space weather changes in interesting ways. For instance, as the extreme ultraviolet output of the sun decreases, the upper atmosphere of Earth cools and collapses. This allows space junk to accumulate around our planet. Also, the heliosphere shrinks, bringing interstellar space closer to Earth; galactic cosmic rays penetrate the inner solar system and our atmosphere with relative ease. (More on this below.) Meanwhile, geomagnetic storms and auroras will continue–caused mainly by solar wind streams instead of CMEs. 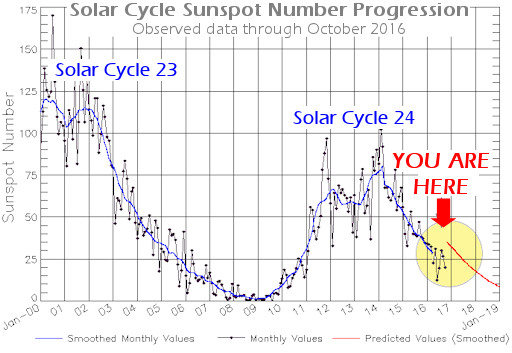 Indeed, Solar Minimum is coming, but it won’t be dull. Recently, we have expanded the scope of our measurements beyond California with launch sites in three continents: North America, South America and soon above the Arctic Circle in Europe. 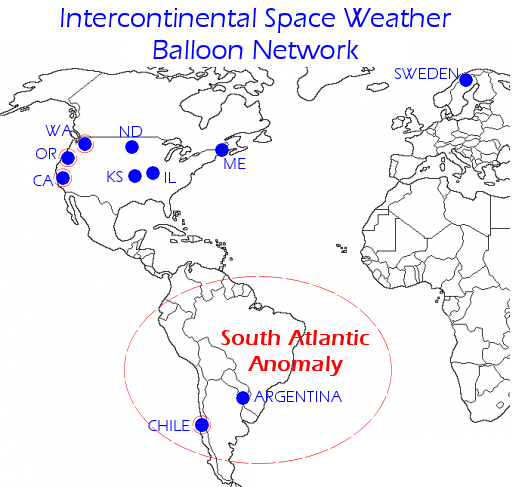 This Intercontinental Space Weather Balloon Network will allow us to probe the variable protection we receive from Earth’s magnetic field and atmosphere as a function of location around the globe. Recent additions expand our coverage north of the Arctic Circle (Sweden) and closer to the core of the South Atlantic Anomaly (Argentina). We also hope to add a site in Antarctica in 2018. The purpose of launching balloons from so many places is to map out the distribution of cosmic rays around our planet. A single launch site is simply not enough to reveal the nonuniform shielding of our planet’s magnetic field and the complicated response of our atmosphere to changes in solar activity. The curves show radiation levels vs. altitude for each of the four sites. Numbers in parentheses are magnetic latitude–a measure of distance from Earth’s magnetic equator. At a glance we can see that atmospheric radiation is a strong function of magnetic latitude. Washington State at +53o has more than twice the amount of radiation as southern Chile at -29o–despite the fact that the Chilean balloon flew into the outskirts of the South Atlantic Anomaly. Clearly, Earth’s magnetic field provides very uneven protection against cosmic rays. To explore these findings further, we are planning additional network launches every month from now on, adding new sites as often as possible. A launch from inside the Arctic Circle in January 2017 is highly anticipated. Stay tuned for updates from the Intercontinental SWx Balloon Network.